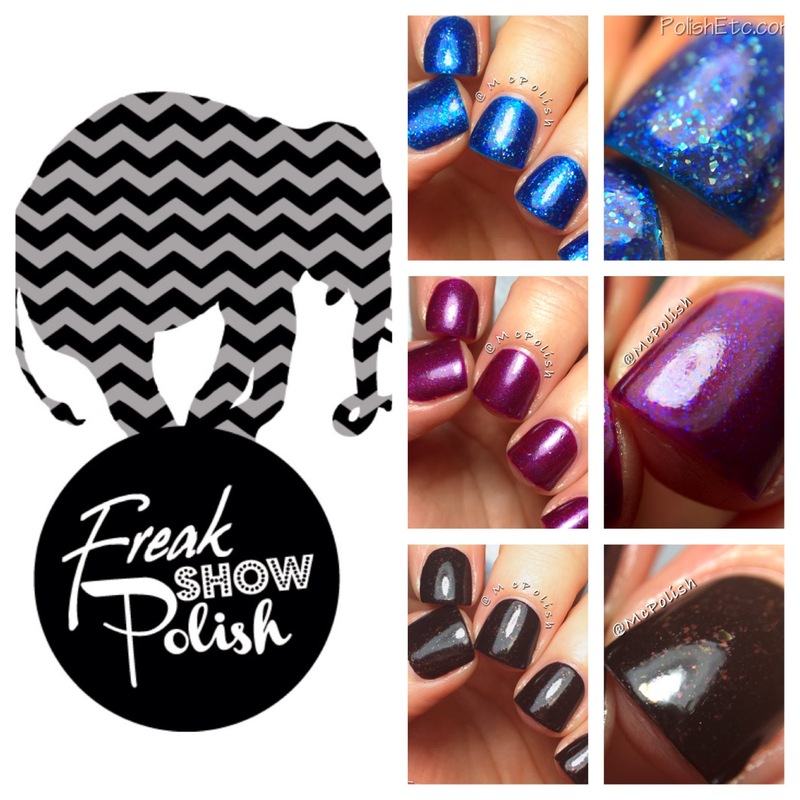 Freak Show Polish: Ladies of the Night Trio - Polish Etc. This post is picture heavy, but be sure to click on through for all the flakie goodness! First up is "Burlesque" which is a blackened base with a mix of gold and copper flakies. This was a one coater for me (I usually do fairly thick coats) with a top coat. You could likely do thinner coats and get more flakies to build up on the nail. But I just love a one coater! Next up is "Can-Can". I do not have a similar polish in my collection. Can-Can is a deep raspberry color with bright blue flakies. I used 2 easy coats with a top coat for these photos. I wore this color all day and got compliments from every woman I saw! This shade would be flattering on a multitude of skin tones. It's a keeper! Last but certainly not least is "Cabaret". Holy hell...this polish is amazing! Like totally amazing! I used two coats with a top coat and then a matte top coat for these photos. The minty and icy flakies just pop right out of this bright blue base, it really glows from within. And the matte top coat just makes your mouth drop in awe. Matte all the flakies!!! There is no doubt that you need this polish in your collection. This trio of polishes launched on Feb 8th at FreakShowPolish.com and you will probably need all three :) I can't wait to hear what you all think about them! These are gorgeous, nice swatches! I have the matte blue macro as my background right now. So amazing!